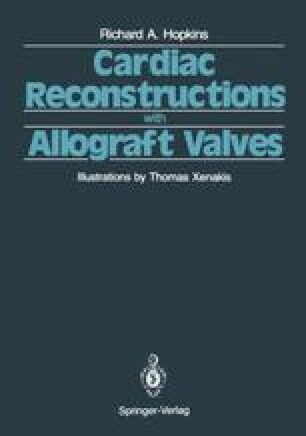 The use of human allograft heart valves for replacement of congenitally defective or diseased heart valves has become clinically accepted in cardiothoracic surgery. From the early days of using wet-stored “nonviable” homografts to current methods of transplanting cryogenically preserved “viable” allografts, the superiority of human heart valve implants has been well documented.1–7 However, as the clinical utilization of heart valve allografts increases, the availability of this human tissue will become a factor. With approximately 25,000 adult aortic valve replacements and 5000 pediatric reconstructions done annually in the United States,8 ways to maximize the number of heart valves available for transplant must be sought.